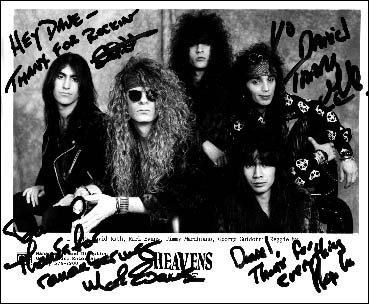 Heavens Edge is a great hard rock band formed in Philadelphia, PA in April 1987 by Reggie Wu (guitars, keyboards) and Mark Evans (vocals). They were joined by David Rath (drums), Steven Parry (guitars) and George "G.G." Guidotti (bass). 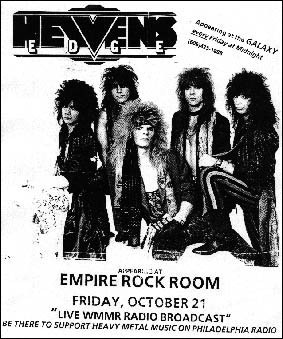 The band started out playing clubs like Empire, Galaxy, and Trocadero on the east coast. Their first attempt to reach beyond the local music scene was a demotape of five songs that all later ended up on the debut album. It caught the attention of many fans and the metal press, including the European magazine Metal Forces. 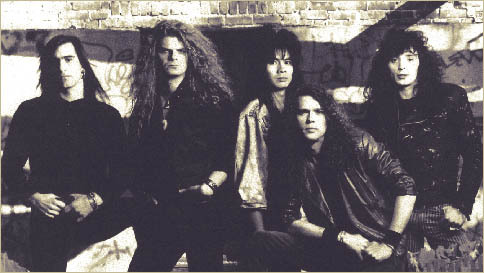 The popularity of the demo and their energetic live shows made Columbia Records sign the band, and in 1990 Heavens Edge recorded and released their self-titled debut album. Produced by Neil Kernon of Dokken and Queensryche fame it was an impressive record with diverse material ranging from their specialty power rockers like "Play Dirty", to poppier songs like "Find Another Way", the slow, heavy blues of "Is that All you Want?" and the thrashy "Can't Catch Me". A video was also shot, surprisingly for the fast rock'n'roll tune "Skin to Skin", one of the album's best tracks, but maybe not the most MTV and radio friendly. The band had already shot half the footage for the next video/single Find Another Way. When the president of Columbia records, decided to pull the plug on the video. Without the label support, the band thought it was best to split with Columbia, and look for another record deal The band shortly signed a development deal with Capitol Records. 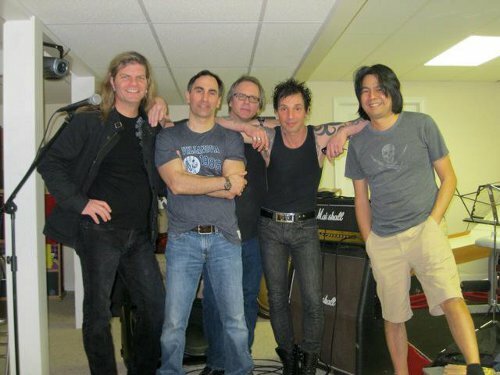 A year later, the band had written enough material for a second album, and with former LeCompt guitarist Jimmy Marchiano replacing Steven Parry, Heavens Edge prepared themselves to return with a vengeance. They premiered most of the new songs live in 91-92 before going into the studio. Songs like potential radio hit "Jacky", acoustic ballad "Just another Fire" and their trademark power rockers "Jump on it" and "Burnin' the Candle" show that the band had retained their ability to write diverse material of high quality. But the times had changed, Grunge and Alternative ruled MTV and radio and there was no place for real rock 'n' roll bands like Heavens Edge anymore. Capitol Records decided to not pick up Heavens Edge, and the band shortly broke up after. Reggie, Dave and G.G. continued working together. They got a singer, Shaun Carmen and formed a new band called American Pie. A different style to Heavens Edge with a sound more in tune with what was happening in the early 90's. They tried for a couple of years to get a record deal, but didn't have any luck, and they split up eventually. Well this could have been the end for Heavens Edge, but in some amazing news the guys signed a new record deal for MTM music in 1998. They are a company specialising in AOR and melodic hardrock. The album was originally scheduled for released in 1992. But some six years later they finally completed the album. Mark, Reggie, Dave and G.G. also entered the studio to record the songs "Rollercoaster" and " Cuts Both Ways". The second album "Some Other Place - Some Other Time" was released by MTM music in Europe and Pony Canyon in Japan in 1998. A year later Perris Records released the album in the U.S. This version has a different artcover and six added bonustracks. SOPSOT continued where the first album left off, and is full of great melodic hardrock. It has everything from power rockers like "Backseat Driver" to the catchy "Rock Steady" to ballads like "Just Another Fire". Any old fan of Heavens Edge will most certainly love this new album. And they will surely gain a lot of new fans as well. In 1999 The band were asked to record a song for the Motley Crue - Kickstart My Heart tribute abum. The guys went into the studio and recorded "Don't Go Away Mad (Just Go Away) of the Dr. Feelgood album. Proceedes of the Cd sales are donated to the Skylar Neil Memorial Foundation. This was set up to help children in hospitals, after Motley Crue frontman Vince Neil lost his 4 year old daughter to cancer. Over the last couple of years the band has reunited several times playing for charity and benefit shows. The debut album was re-released 2012 on Rock Candy Records. Remastered with bonus tracks. In 2013 the band will play in Europe for the very first time at the Firefest, 10th Anniversary show. Daniel Staresina & Maciej Stoinski. © 1997-2013 Daniel Staresina for danstar productions. All rights reserved.